Ten years ago, the Irish saver could put their money in bank accounts paying close to 5%. The cautious investor could afford to take no risk with their money. That seems a world away now. Bank savers in Ireland have faced a decade-long slide to zero returns. Interest rates have never recovered, and show no sign of doing so in 2018. So what should the disappointed saver do? What if you had invested your money? Those who have been prepared to take some risk with their money have been substantially rewarded over the same time period. 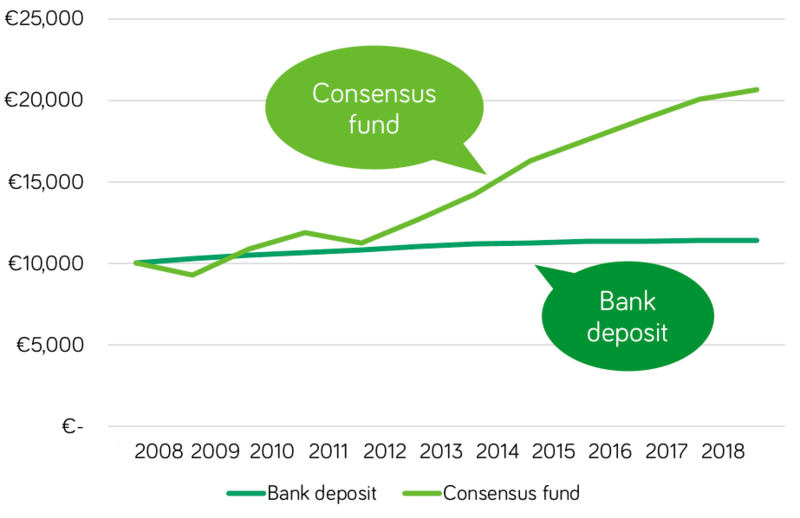 Our chart compares bank deposits to the performance (before fees) of €10,000 invested in Irish Life’s €4.6 billion Consensus fund (a representative example of many Irish people’s fund investments). If your ten grand was in the bank, it could be worth around €11,400 now. If it was invested, it would be worth somewhere around €20,600! As we all know, investing carries risk. So if you’re thinking of becoming an investor as well as a saver, you may prefer to start with some fairly cautiously managed investments. We’ve outlined three investment funds that could provide an answer. Moneycube believes that a multi-asset fund should form the cornerstone of most investors’ portfolios. At the low-risk end, fund managers sometimes leave a lot of the fund’s value in cash. We don’t see much sense in you paying them fees to do that. So look for a fund which isn’t carrying too much cash. The dominant assets are likely to be government and corporate bonds. Standard Life’s MyFolio Active 2 fund, is one example. It is managed for low volatility (ie no dramatic ups and downs), and has delivered annualised growth of 4.2% over the last five years. Most with-profits funds died with fax machines in the 1990s. Zurich’s Super CAPP fund is one of the great survivors. With-profits funds are attractive to the cautious investor, because the fund manager can decide how much profit to share with investors each year. That means they can save money made in good years in order to smooth returns in bad years. Zurich’s fund is marking its 40thyear in operation this year, and has delivered a positive return in every year. In fact, Zurich calculate that a €100,000 investment made back in 1978 would be worth €3,372,669 today. Absolute return funds became popular in the noughties. Their stated aim is to deliver a positive return in all market conditions by using hedging strategies (for example, betting on markets falling as well as rising). But not all absolute return funds are equal, and some have performed poorly, as we have described in other blogs. Friends First’s €6.3 billion Concept K fund, run by Deutsche Asset Management, has a decent track record. In the 7 years to May 2018, it delivered an annualised return of 8.6%. It is highly diversified, with over 100 holdings in company shares, government and company bonds, gold, and currencies. 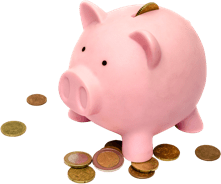 There are lots of alternatives to leaving money in the bank for the cautious investor in Ireland – talk to Moneycube today about how we can help.